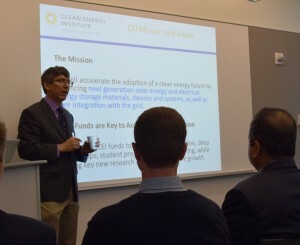 A group of more than twenty Washington state legislators and staff members received an update on the work at the UW Clean Energy Institute (CEI) this week (September 29.) The UW CEI was established by the Washington State Legislature in 2013 with a $6 million biennial budget investment. Tuesday’s tour allowed the elected officials, government staff members and industry partners to get a close look at the results of the state’s investment as well as the institute’s progress in research dedicated to next generation solar energy materials, storage devices and renewable energy integration into the smart grid. 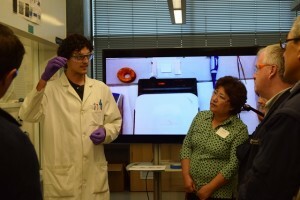 During the tour they met new energy research faculty who recently joined the CEI, and experienced high-powered microscope and laser demonstrations using state-of-the-art equipment used by UW faculty and industry partners to study and develop new energy materials. The CEI funded 26 graduate student fellowships to catalyze clean energy research across campus and among multiple disciplines. The CEI sponsored the Clean Energy Prize for the UW Environmental Innovation Challenge, a statewide competition for student teams to develop products and services for environmental and clean tech applications. 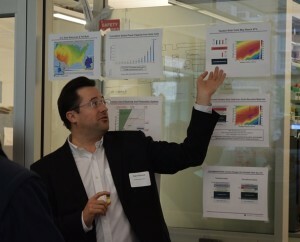 The CEI established a regular seminar series that brought top global scholars in energy-related disciplines to campus. The CEI also leveraged state support for an additional gift from the Washington Research Foundation of $6.74 million. The gift is being used to accelerate joint faculty and post-doctoral hiring with the Pacific Northwest National Laboratory. CEI was also able provide matching funds that led to additional collaborative grants from foundations and federal programs in excess of $10 million. The CEI has helped the UW acquire new shared instruments valued at more than $4.5 million by leveraging $1.6 million of matching CEI funding. 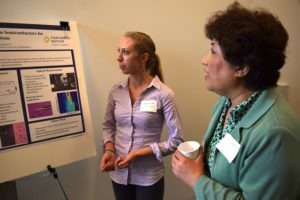 The tour concluded with a poster and demonstration session that allows graduate and undergraduate students to present their research on clean energy topics and discuss their UW educational experience with state legislators and staff. Read more in this blog post from UW Government Relations. CEI Director Dan Schwartz provides and overview of first year milestones to legislators, government staff and industry representatives. State legislators Cindy Ryu and Jeff Morris learn about cutting edge solar energy materials research at the UW Clean Energy Institute. Prof. Hugh Hillhouse explains recent improvements in solar cell technology. UW Clean Energy Institute graduate fellow Genevieve Clark discusses her research at a lunchtime poster session.